I have made so many pairs of these pants, but have never blogged them! 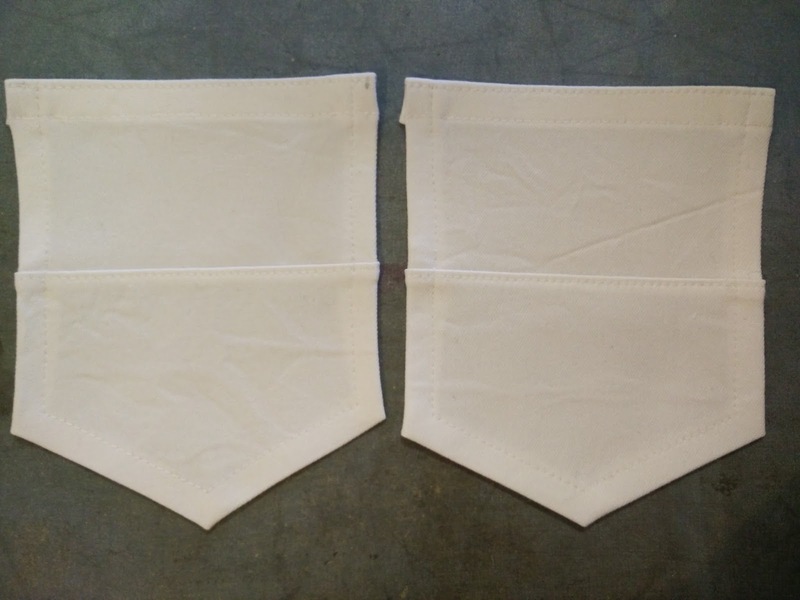 They are a sleek and simple design, made with very stretchy, woven fabric. Make sure your fabric is very, very stretchy, or you won't get them on. Ask me how I know this! 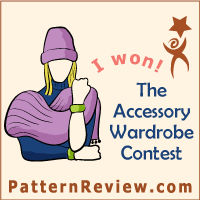 Note: discount code for this pattern at end of post. At first, I made them from bengaline, as recommended by StyleArc, and they were fabulous. 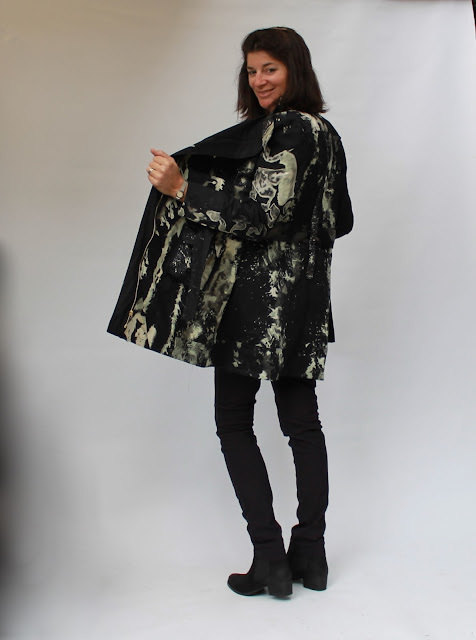 I have a picture of some black bengaline ones from an old post about my Splattered Jacket. More recently I have been hacking them to look like jeans. I have made three pairs like this, but only photographed the white pair so far. I am really pleased with these. They look like jeans, but are soooo stretchy and comfortable they feel like leggings. Don't tell anyone they are almost jeggings! I took a few photos while I was making these to show how I made them look like jeans. To start with, I added a mock fly front, by adding some fabric to the front crotch curve at the cutting out stage. I used my Jamie jeans pattern for the fly curve, but you could just draw it freehand. 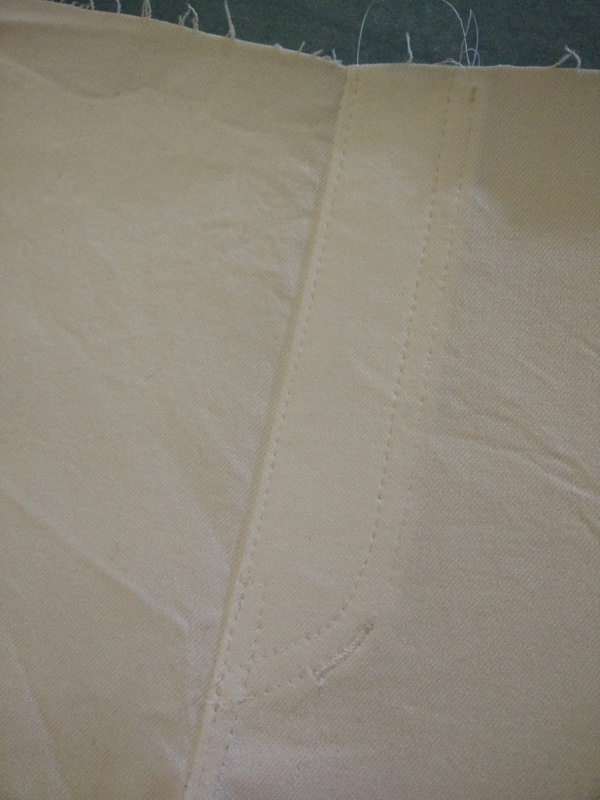 I marked the original front edge line on the fabric and stitched 1cm away from it, to account for the seam allowance. 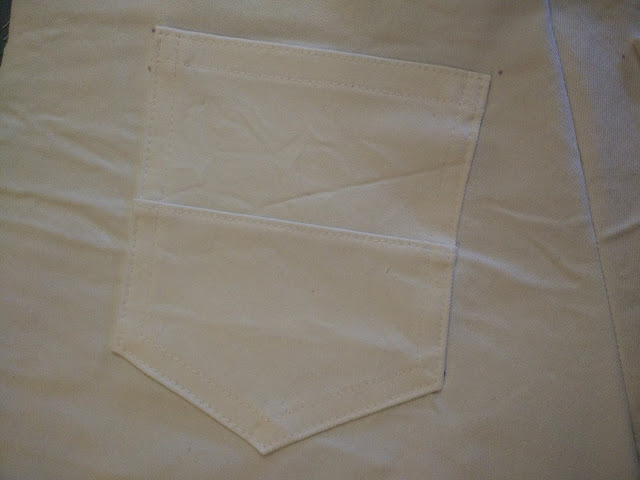 The right side was then topstitched to look like a jeans fly. Next I made back pockets, also from my Jamie jeans pattern. It would be simple to copy some from existing jeans. 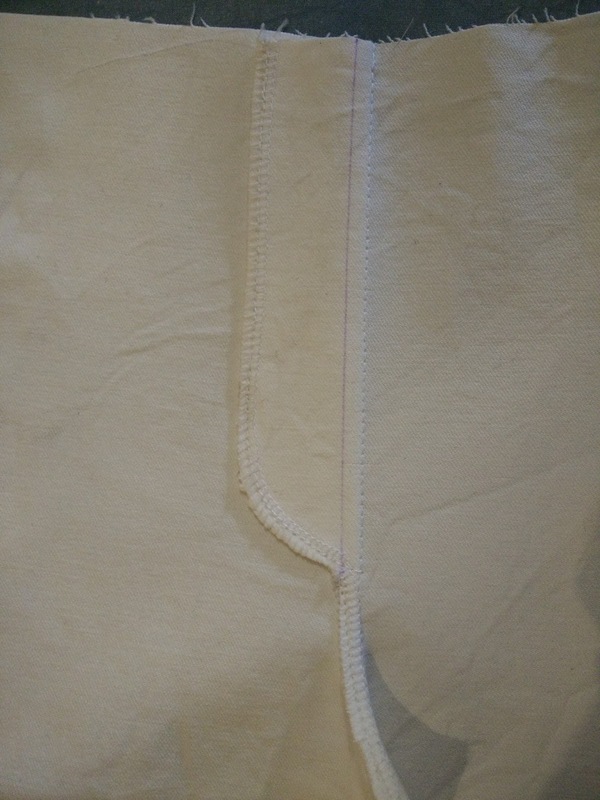 I did the inner line of topstitching before I sewed them in place. I sewed them on according to the pocket placement markings on my Jamie jeans. The top I'm wearing is also StyleArc. This is the Amber top, which I have previously made from Japanese cotton. For this one I used woven cotton for the front and back and cotton knit for the sleeves and detailing. 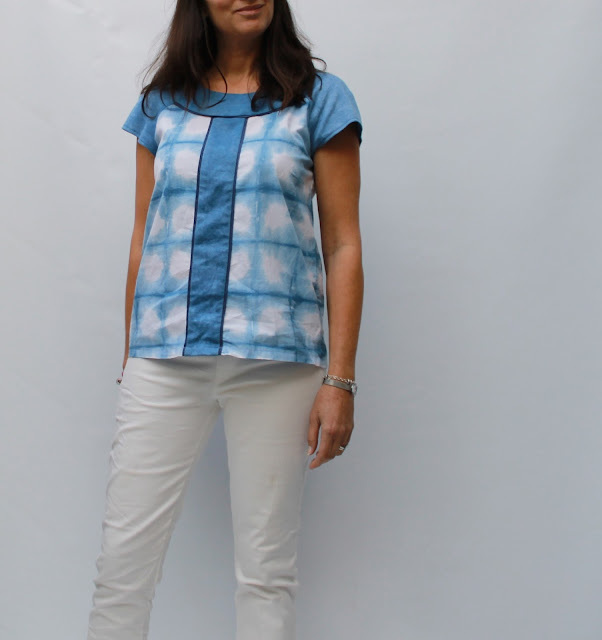 To make it I sewed the side seams together first, then folded it shibori-style and dyed it in natural indigo. I also dyed the sleeves, yoke and front stripe. Once everything was dry, I sewed the rest of the top together. 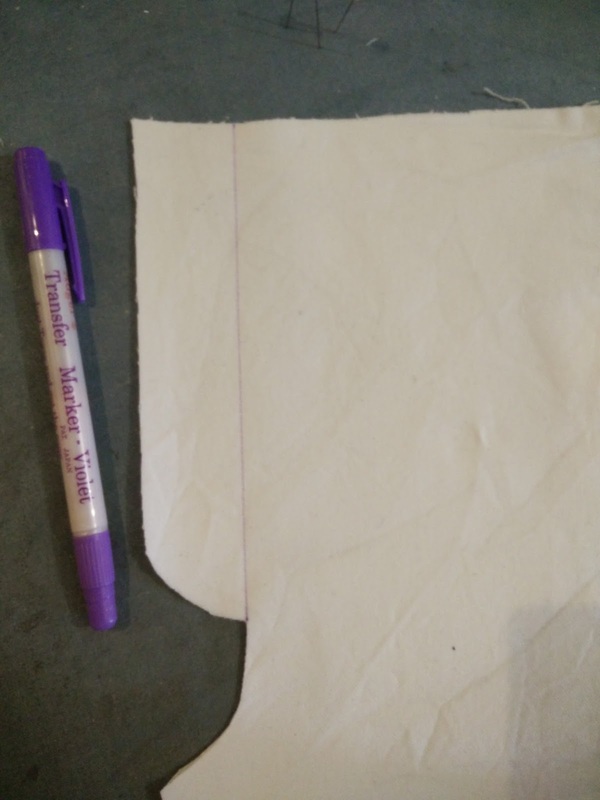 This technique ensures perfect pattern matching at the sides! A perfectly, secretly, comfy outfit! To get this pattern for 20% off, visit the StyleArc Gumroad shop and enter the code meggipeg20. I will receive a small percentage of any sales made. UPDATE: this code may no longer be valid. I am so impressed with your whole outfit. The colours are gorgeous. The pattern in the fabric of the top looks great...I can't believe you dyed this...so clever. Your changes to the elle pants look great and I am so tempted to copy this. Thanks so much for sharing the details. Thank you so much. I would be very flattered if you copied. Go for it! I love both pieces. Thanks for sharing your own construction details. So clever and useful! Thank you so much Helene! Thank you! The super stretchy denimy fabric is a winner for these. What great ideas. Love the pants, do you find that stay up ok? Genius to dye after sewing! Thank you. Yes, these seem to stay up well. They have an elastic waistband that is high enough to hold them on. There may be the odd hitch up during the day. Great pants - especially the jeggins. 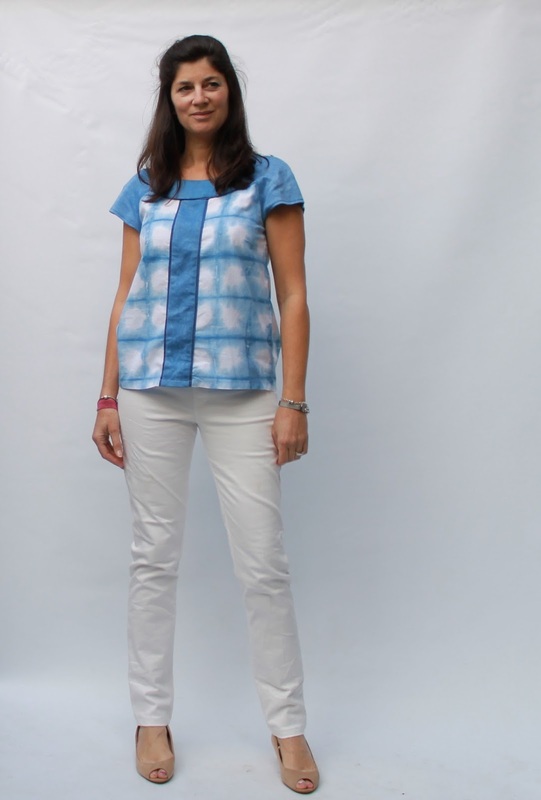 I bought a similar pattern from Stylearc for a pull on -faux denim skirt. Oh yes, that skirt look like a good one to try! Lovely! I love both garments!